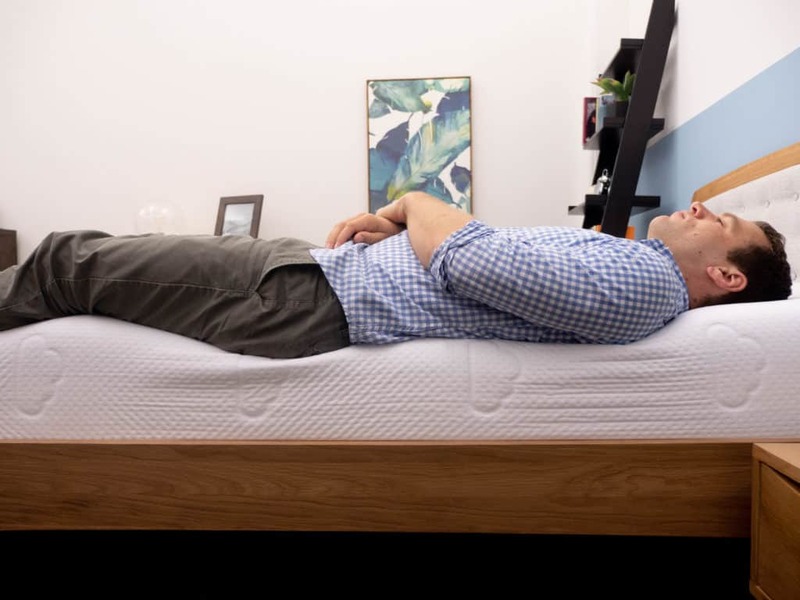 Hand-crafted in the United States, the Puffy mattress is here to bring customers a cloud-like sleep that’s as pressure-relieving as it is supportive. And how does it aim to do this? With an all-foam design that’s gentle and adaptable to each sleeper’s unique body. 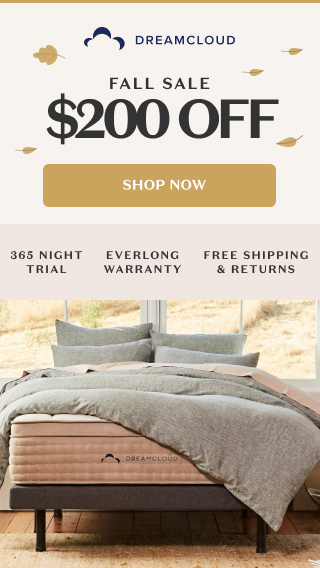 While this certainly sounds impressive, I won’t know how comfortable the Puffy mattress actually is until I put it to the test, sussing out its construction and feel to see if it might just be the bed of your dreams! The Puffy features a straightforward design with just two foam layers: one of thick memory foam and another of high-density poly foam. While the construction might seem a little simplistic, the brand says the combination of materials has been specifically selected to bring targeted relief to the spine. I should mention that for the purpose of this review, I’m only taking a look at the Puffy Standard. The company also sells a Lux mattress that comes with an additional layer of cooling memory foam. But enough chat! Let’s dive into this bed. Cover – The cover is made of polyester, making for a soft and elastic material. I also found the fabric to be pretty thin, which encourages airflow throughout the mattress. Comfort Layer – Comprised of 4” of gel memory foam, the comfort layer here is super soft and has a very slow response to pressure, which means you’re likely to sink in deep for some intense body contouring. 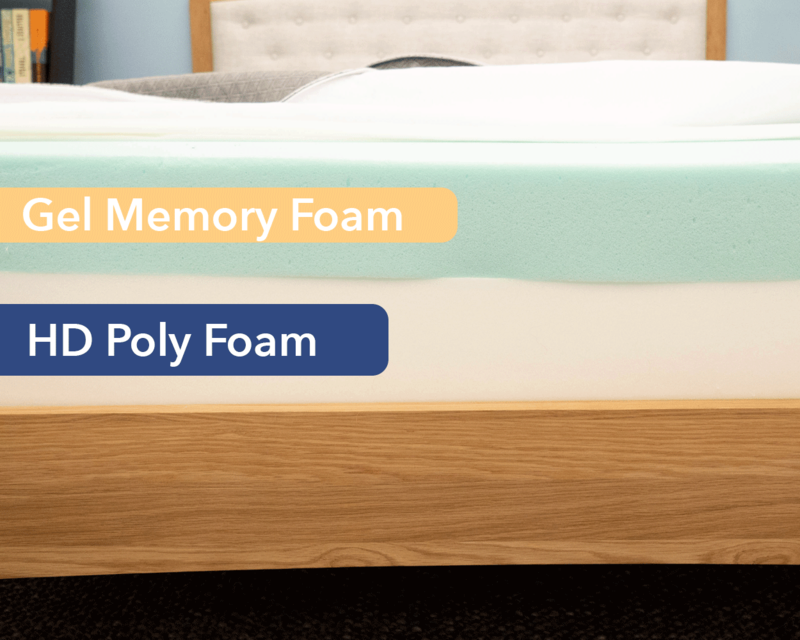 While it’s typical for all-foam beds such as this to feature a top section of memory foam, this layer in particular is incredibly thick and should bring some satisfying relief to the shoulders and hips. And though memory foam has a bit of a reputation for overheating in the night, Puffy has managed to mitigate this with a gel infusion intended to keep things nice and cool while you sleep. Support Layer – A lack of a transition layer* brings us straight into the main support system of the mattress, composed of 6” of high-density poly foam. Unlike the memory foam layer above it, this section has a quick response to pressure and is quite firm, imbuing the structure with its stability and shape. 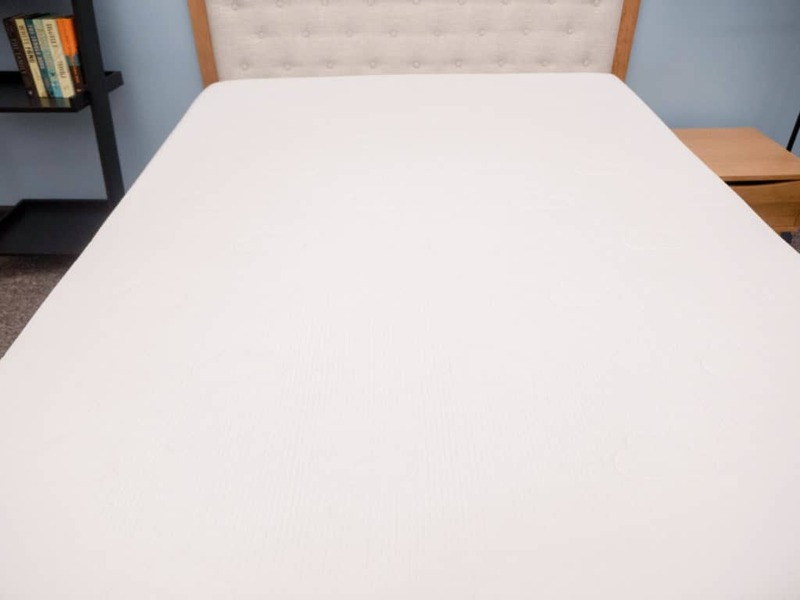 *Heavier sleepers should note that the absence of any sort of transition foam means that you’re likely to interact primarily with the high-density poly foam as you quickly sink through the memory foam comfort layer. Because of this, you may feel the bed as a touch firmer than other sleepers. After inspecting the construction of the Puffy, let’s talk about its firmness and feel. Applying light hand pressure to the mattress, I found that I was interacting almost entirely with the memory foam comfort layer. The material conformed snuggly to my body and I could really feel myself sinking into the bed. Since folks with different body shapes, sizes, and types are likely to experience firmness in unique ways, I decided to bring in three other testers to help me figure out how firm the Puffy is. To do this, we each took a turn lying on the mattress, gave it a personal firmness rating, and then compiled the results on the graph below. While feel is always going to be a personal thing, our responses should give you a solid sense of the firmness range you can expect from the bed. As you can see in the graph above, we were pretty much in agreement about the firmness of the Puffy, landing on an average rating of 5.4. When compared to the industry standard of 6.5 for medium firmness, it’s clear that this bed is quite soft. I personally gave the bed a 5.5 as I found its thick memory foam layer created a gentle, pressure-relieving feel. 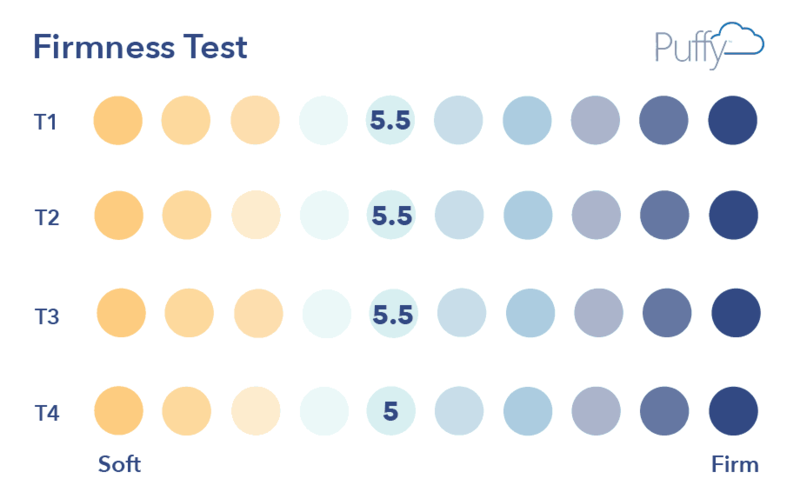 While the high-density poly foam in the base is firm and does bring some support to the overall structure, you’re still likely to feel as though you’re sleeping more “in” this mattress than “on top” of it. Keep in mind: If you want an even softer feel, you may want to check out the Puffy Lux, which has an additional layer of memory foam for an ultra-plush vibe. Another important factor to consider when purchasing a new bed is pressure, or more specifically where pressure points are going to form while lying on top of it. Back – Lying on my back, I could really feel myself sinking into the mattress, with the memory foam in the top layer working to contour to my body and fill in the space at my lumbar region. While this led to some great pressure relief in this position, it did make it difficult to move around and change positions. Edge Support – Scooting as close to the side of the bed I could, I felt some decent support from the Puffy. I kind of expected the mattress to collapse here at the edge, but the high-density poly foam did a good job of holding up my weight even as I compressed through the memory foam. Side – Rolling onto my side, I felt some fantastic pressure relief. I’m not too surprised by this as side sleepers tend to go for softer mattresses that provide cushiony support to the shoulders and hips, typical problem areas for those who doze on their sides. 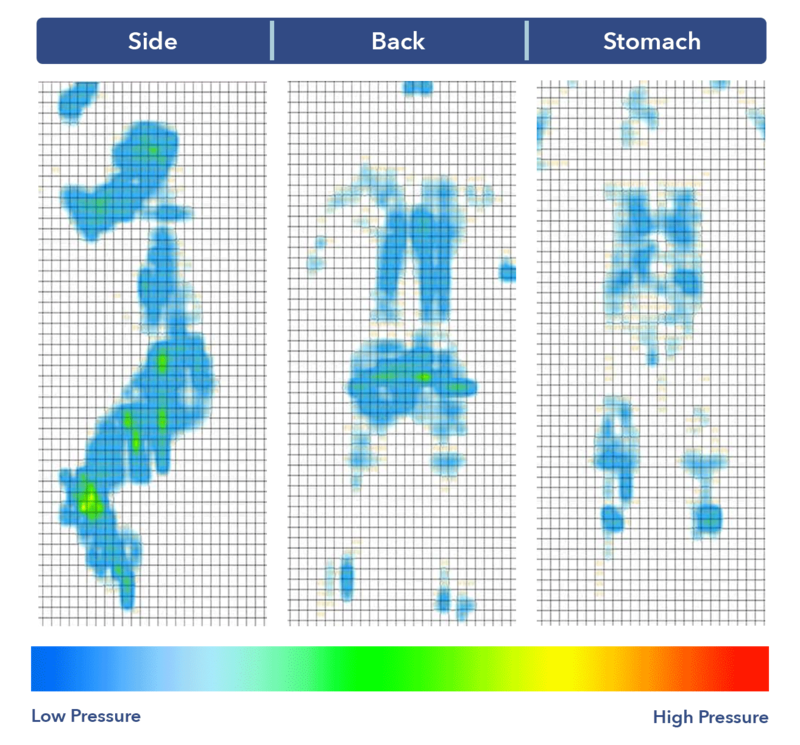 Stomach – While the thick memory foam comfort layer is a big win for side sleepers, it’s a bit of a mixed bag for stomach sleepers who usually opt for firmer structures that keep the spine in an even alignment. Here, I could feel my hips sinking out of line with my shoulders, which caused some discomfort in this position. So that’s it for this post. 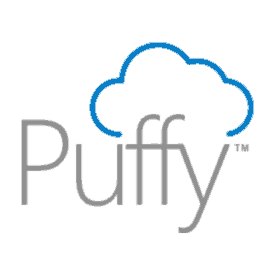 Use THIS LINK to get Puffy.